Hairjelly is a nutritional hair loss supplement containing a rich source of essential amino acids that are the building blocks of keratin, the protein that hair is made up of. This in turn allows the hair to grow at its natural optimum level. Why 90 days? It takes approximately 3 months for the hair to respond to any type of stimulant due to the way hair grows. 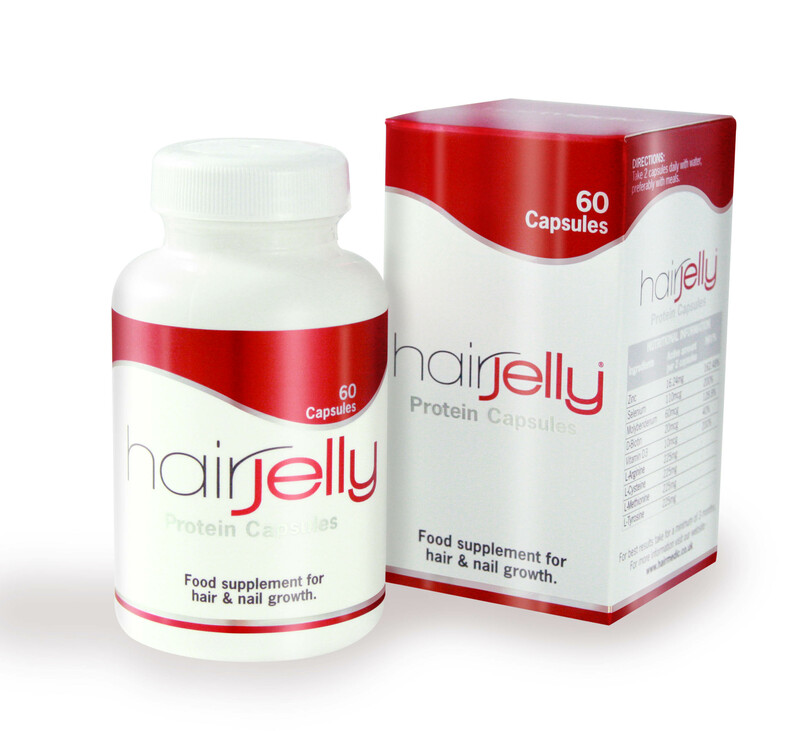 All you need to do is take Hairjelly protein capsules twice daily for three months. Simply enter the promo code 90day into the coupon area at the checkout to get £15 off when you buy 3 or more bottles. Formulated by Iain Sallis (one of the UK’s most recognized Trichologists), making it the ideal hair loss supplement for; fine hair, hair which is breaking, hair loss, limp hair, thinning hair and weak hair. Hairjelly is not a substitute for a healthy diet. For results take 2 capsules per day in the morning, take for a minimum of 3 months. Hairjelly is not a substitute for a healthy diet. Hairjelly may be used by anyone who is concerned about the appearance and general condition of their hair or scalp, or by those showing age-related changes wishing to help support the hair’s nutritional needs. Not recommended for the elderly or pregnant/breast feeding women, if you have concerns please email us at – questions@hairmedic.co.uk to discuss. How and when should Hairjelly® be used? 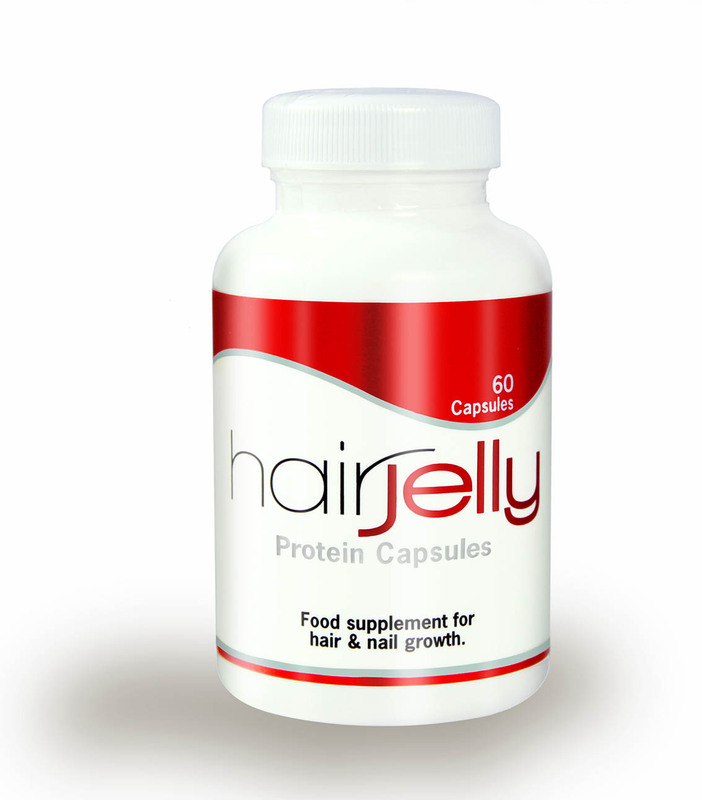 It is best to take Hairjelly in the morning, as this is when the body craves protein the most. Two tablets per day are ideally recommended, with water. Do not exceed the recommended intake. Taking the tablets with a your breakfast or a meal at any other time of the day maximizes the absorption of the nutrients and can reduce nausea, which is sometimes experienced if multivitamins are taken on an empty stomach. Hairjelly supplements should not be chewed. Hairjelly has not been designed to be taken during pregnancy. Can Hairjelly® be used simultaneously with medications? Hairjelly can usually be taken alongside medications because it contains only moderate levels of amino-acids, vitamins and minerals and it is free of any drugs or hormones. As with other food supplements, seek professional advice before using if you suffer from food allergies and consult your doctor or pharmacist for advice on taking Hairjelly with specific medication. Are there any undesired effects whilst taking Hairjelly®? Hairjelly has no known side effects when taken as directed. Do not exceed the recommended tablet intake. In case of overdose, seek medical advice immediately. Diabetics should consult their doctor before using this product. Results vary amongst individuals, but in most cases, we would expect the beneficial effects of the amino-acids in Hairjelly tablets to be seen in 3 to 4 months (as this is how long it takes for hair to cycle through the shedding phase of the hair cycle). There is no maximum length of time over which Hairjelly supplements may be used. A regular intake is recommended. Hairjelly is not tested on animals and is suitable for vegetarians and vegans. Always read the product directions before use. Do not exceed the recommended intake. As with other food supplements seek professional advice before using if you suffer from food allergies, and consult your doctor or pharmacist if you have an underlying medical condition. Vitamin supplements are not intended to treat or prevent any disease. Food supplements must not replace a balanced and varied diet, and a healthy lifestyle. Here at Hairmedic Solutions Ltd, we will do our very best to process your order within 24 hours, if your order is placed before 2pm Monday to Friday. Orders placed after 2pm for delivery will be subject to delivery within 60 hours. The above is based on working days (Monday-Friday, excl weekends, bank holidays and may be subject to alteration due to weather conditions, industrial action and unforeseen circumstances). We cannot be held responsible for any hoo-hahs that are out of our control but please rest assured, we will go to extraordinary lengths to make sure you receive Hairjelly as soon as possible via Royal Mail (2nd class recorded delivery). Requests must contain the following: First name, last name, telephone/mobile number and email address. This information must be identical to the information originally submitted on your order. Please provide contact information so that we may contact you if we have questions in regards to cancelling your order or requesting returns. Every effort will be made to accommodate the processing of your request as soon as possible after the receipt of your request via email, providing your order has not been charged and/or shipped out. In the event that a cancellation was submitted and your order was shipped out after, we will gladly refund the complete balance charged excluding delivery (£3.95). We undertake to respond to your request via email to inform you of actions to be taken within 5 working days. This is subject to you returning the products ordered unused, in good condition with the security seal on the lid intact. We cannot entertain refunds and cancellations for products that have been opened, damaged or partially used. We cannot entertain refunds which are not bought directly from Hairmedic Solutions Ltd, ie our website. If you buy from one of our retailers you must take your product and receipt back to the store you bought the product and seek their advice, terms and conditions.